Pitching several tents together and comparing how they perform in wind and rain is quite instructive. Sit inside. How much does the fabric move? How noisy is it? Sit in the next one. Is it quieter, noisier, flappier? Other aspects matter too. What about head room, floor length to stretch out in, storage space? Ease and speed of pitching? Cooking undercover? I've been doing this testing on and off a fair bit recently, building up to writing a now nearly complete backpacking tent review for the July issue of The Great Outdoors. It began last autumn when the first models for the feature arrived. I mentioned it in this post in early April. The tents pictured then along with the one above and those below plus a couple more will all be reviewed. Note how much greener the grass is in the above photo compared with the photos from April 3rd. Spring really has come, at least down here. Looking forward to reading the article as looking to replace my old Helium 200 and was thing about the Trail Star. 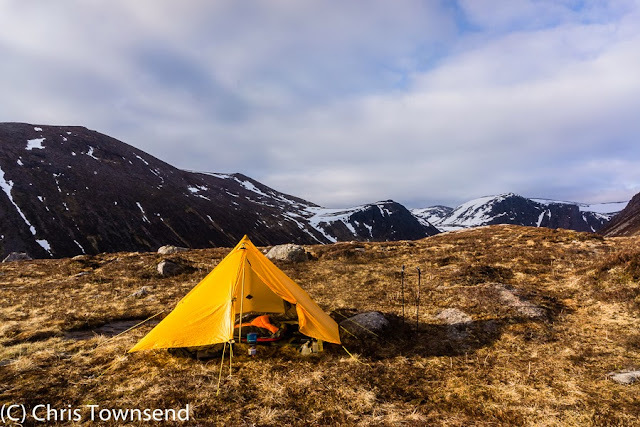 The Trailstar is excellent, one of my favourites. It won't be in this review though as I've reviewed/recommended it quite a few times already. So, I am seriously looking to change it for the new Hilleberg Enan which to me ticks all the box's. ..except price! So I am interested in thoughts on it Chris!? The Enan is very well made. So far so good but more testing needed. Thanks Chris, I'll await your final verdict!! Hi Chris! thank you for your very good articles and essay writing. Will you be looking at the Exped Mira 1? It seems very spacious, but I can't find much information on how it would stand up to British conditions. I won't I'm afraid Alec. I haven't had one of those to test. That's a shame. Maybe it will get reviewed eventually - it looks like it might be good if it's robust enough, and there aren't many UK stockists so it's hard to see it in person to check.